Special Report: Your Wealth Consciousness is Under Attack! Every day you receive tens of thousands of subtle messages which directly undermine your Wealth Consciousness. Did you know that this year, hundreds of thousands of Americans are expected to be too broke to file for bankruptcy? Anywhere between 200,000 and one million US consumers are estimated to be unable to afford the $1500 cost of bankruptcy. Another 200,000 consumers, who would otherwise not have enough money to file, will use their tax refunds to pay for bankruptcy this year. Yet the Wall Street Journal reported recently that America added 200,000 new millionaires last year. What is the difference between these two groups? The TV is on. The happy family are excited to go to Disneyland. Your children get excited they want to go, too. The restaurant commercial comes on. The steak looks juicy, sizzling and irresistible. Your girlfriend/boyfriend suggests you both go out to dinner. A letter arrives in the mail. You are pre-approved for a $10,000 loan. 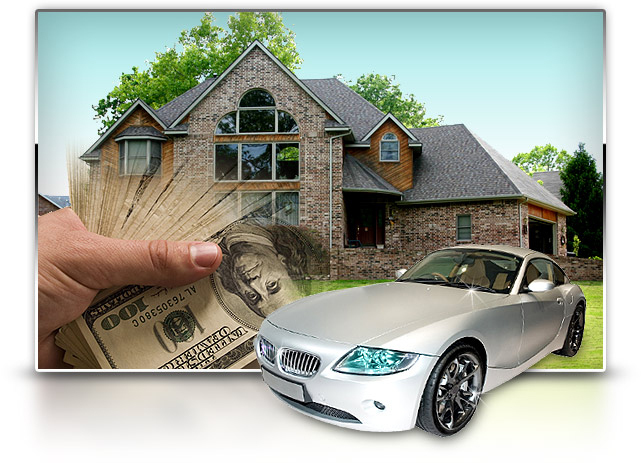 The bank teller tells you that the bank will transfer equity in your home into cash in your bank account, because (this is the subtle message) you are rich! You wake up one day bankrupt with no idea how it happened. Day in, day out, you are bombarded with subtle messages aimed at influencing your subconscious mind to consume and spend beyond your capabilities. You look rich, but you aren’t. “I’m a salesman and I came to Dr. Steve G. Jones for help in boosting my income. In the WEEK following my session, I made an extra $10,000 in commissions. Face it, you already work hard. Maybe you have 2 or even 3 jobs. The answer is not to work hard. And I bet you are pretty smart. So working smarter isn’t it either. And you are ethical, so robbing a bank won’t cut it, plus who wants 20 years in a small room? Everywhere we turn, society and advertisers are flooding our minds with influences and messages which bring us poverty and bankruptcy. We have to turn that around and flood our minds with influences which bring us wealth. “I just have to tell you that you are seriously amazing and that I never expected that Program Yourself For Wealth would work for me but they are working!! Anyone — literally anyone — can become wealthy no matter what their skills, education or background. The secret is what you put into your mind. I use hypnosis to influence your mind in the direction you want it to go. 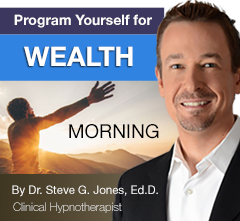 Hypnosis opens the door to unlimited wealth by helping you relax, focus and become more motivated to go after the opportunities that bring about real wealth which is that balance between spending and saving. Hypnosis works by cultivating information and traits already present in you so that you can achieve your full potential. It is a method of clearing the clutter from thoughts and actions that can be crippling to your efforts to better manage your finances or make job related decisions with confidence. It means with little effort and minimal investment you could be living a stress-free life of abundance and freedom – before you know it! Do you have challenges getting out of bed in the morning? Do you hit snooze one, two or even three times? Wake up with my musical affirmation recording. It will help you wakeup with wealth on your mind. You will enjoy waking up with these musical affirmations every morning! Is that condusive to wealth? These Affirmations have been designed by me to get your day off on the right foot. when your day begins powerfully, you have a ton of great energy propelling you forward towards success. This is a crucial time as your mind is even more susceptible to outside influences. Whether you’re a seasoned meditator, or someone that has never tried to meditate before, this program will give you the help you need to take your bank account to another level! All the negative messages you were exposed to during the day are replaced by wealth inspiring messages. Best Audio Quality – Makes the inductions and deepenings more effective, as well as the Stereo Imaging, and Binaural Beats. You will find yourself quickly relaxing and tuning into your wealth consciousness. NLP – I use Future Pacing and Analog Marking to add more impact to this session, which lasts a very quick hour. Usually you will wake up in the morning, refreshed and ready to achieve your financial goals. “After listening to your Program Yourself For Wealth program for a month and a half, I have found myself a business partner who wants to take a business idea I came up with a couple of years ago, and set it up with me. “She had a similar idea herself, but like me, no business partner. Meanwhile we attracted an investor who would like to put in the capital to get us started, and now his company wants to invest a million dollars in our concept for us to roll it out quickly! “So I have a business partner and $1 million investment in my business idea. “Meanwhile my partner has been headhunted twice for two jobs… one which is double/triple his pay and the other one is a role which is exciting and fun and in the same industry as the business I will be setting up. “All in the space of a month. Incredible. 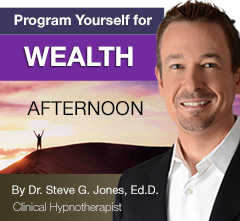 With over 2 hours worth of audio hypnotic sessions, Program Yourself For Wealth is engineered to help you finally achieve the success that you have dreamed of. 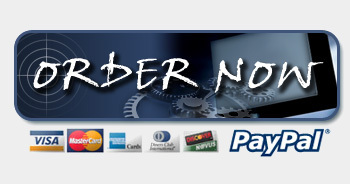 That’s a real world package worth $169.60 (it is more than worth it as you’ll discover for yourself). When you purchase the Program Yourself For Wealth program you will have a full 60 days to experience the program and ensure your satisfaction. And that someone could be making a LOT of money with their subconscious programming working for them very soon. Do you want to stay stuck, while someone else takes the steps to wealth? True financial freedom is a very real possibility once you understand how to program yourself for wealth. It’s like having your own Hypnotist as I point you directly to success! P.S. 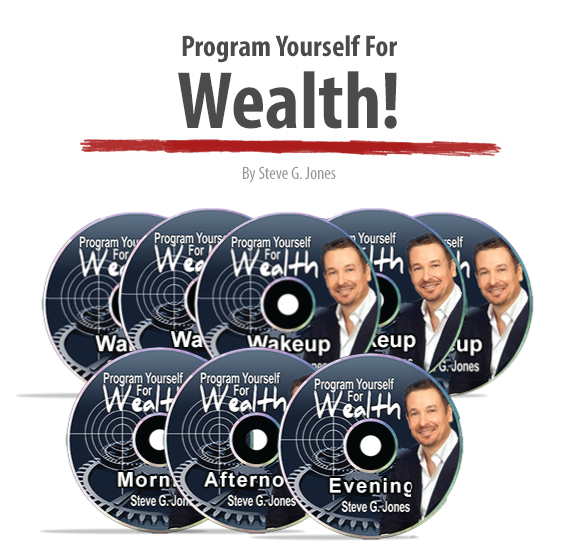 Remember, you can download the Program Yourself For Wealth sessions today and ALL the risk is on me! Try it for 60 days and see for yourself just how powerful these sessions really are. If for any reason you are not satisfied, simple email me for a prompt and courteous refund. P.P.S. There is a very real chance if you decide to think about this and come back later… that the price of Program Yourself For Wealth could be at its regular $129 price. Don’t take that chance. Grab your program today, completely risk free. 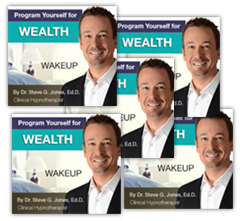 I understand that by taking action and reserving my copy of Program Yourself For Wealth, I’ll get instant access to morning, afternoon and evening sessions to motivate and inspire me to create real wealth in my life! 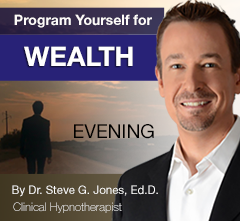 I understand that I have a full 60 day money-back guarantee to examine my Program Yourself For Wealth sessions.